Winter blues got you down? Join us this holiday season to celebrate the best parts of winter! From arctic animals to steaming cups of hot chocolate, this week of camp will explore all your winter favourites using a wide variety of techniques and materials. Camps are offered on December 27, 28 and January 2, 3 & 4. We offer programs for children aged JK/SK to Grade 6, for either the morning session (9:30-12:00), afternoon session (1:00-3:30) or both! Using acrylic paint and collage, we’ll create a movable portrait of ourselves frolicking in the snow! 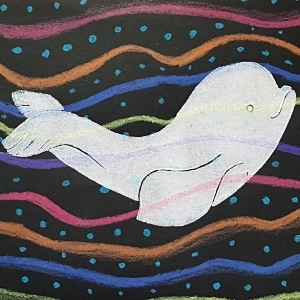 This afternoon we will create a colourful underwater scene that features a beautiful swimming beluga whale. We will use paint to create the background and print our whale on with using styrofoam and printing ink. 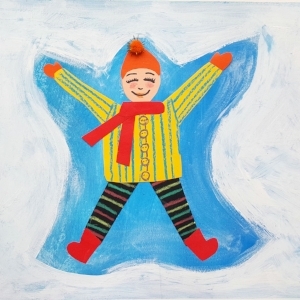 Let’s celebrate the snow by painting ourselves or a friend making a snow angel! We will use acrylic paint on canvas create a colourful snowy scene. 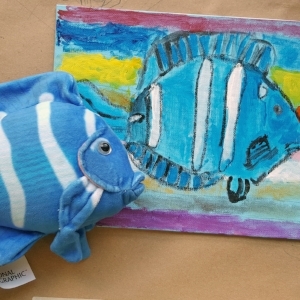 Bring in your favourite toy to paint a close-up portrait with acrylics on canvas. *Grades 1-6 should bring in a toy and JK-SK will paint a cuddly teddy bear. We’ll hit the slopes this morning with a mixed media diorama featuring downhill skiers. Ever wonder where bears go in the winter? This afternoon we’ll paint an above-and-below ground scene of a bear snuggled in its den. This morning we’ll create a mixed media scene featuring a colourful birdhouse and a cute winter bird. We’ll use coloured paper to collage on to a painted background. Let’s go tobogganing! This afternoon we’ll make a self-portrait using modelling clay, paint and other sculpture materials. This morning we’ll design and draw a pattered mitten to catch snowflakes on. Then we’ll make a cut-paper snowflake that will actually twirl in our hand! Afternoon Camp (1:00pm to 3:30pm): We’ll create a mini winter wonderland using sculpture materials. We’ll complete our scene with a painted background, fluffy snow and cut paper trees.